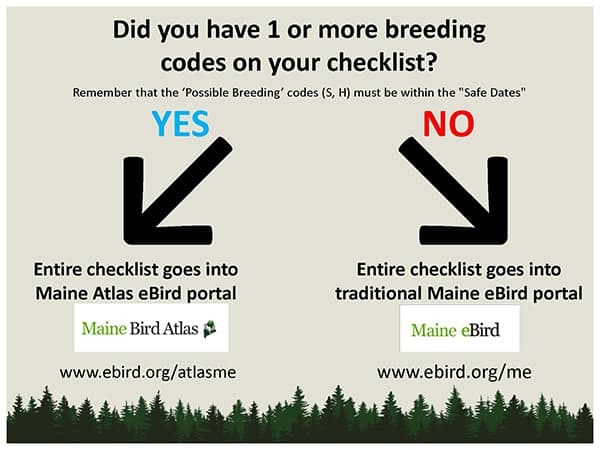 Do you have bird observations (i.e., data) to contribute to the Maine Bird Atlas? All data will be entered through the eBird online database platform developed by Cornell Laboratory of Ornithology. If you know someone who would like to be involved but does not have access to a computer or smartphone, please get them in touch with a regional coordinator. New to eBird? Be sure to review the eBird User Guide! New users should select the "Get Started" button where you will enter your name, email address, choose your username, and create password for your new account. We encourage you to write down your username and password for eBird and keep it in a safe place. If you already have an eBird account, you can sign in with your existing username and password. Can I access eBird from my smartphone? Submit photos on our Facebook page!